I recently ran across this Tweet from NFL Matchup on ESPN – a terrific account you should definitely follow on Twitter if you want to be a better educated football fan. It got me thinking about Chicago’s offense and explosive plays. These offenses generated the most EXPLOSIVE PLAYS this season. Seeing as I’ve already written about Mitchell Trubisky’s struggles throwing the ball deep and Jordan Howard’s lack of explosive runs, I figured the Bears probably ranked towards the low end in this area. Using Pro Football Reference’s fantastic Game Play Finder, I was able to track these stats for every team in 2018 (full data here, slight discrepancies for the 17 teams shown in Tweet above, but all were within 1 or 2 plays). As you can see in the table below, the Bears did indeed not do very well when it came to explosive plays. We can see here that the Bears were slightly below average in every category, meaning there is need for improvement in explosive plays across the board. I’ll also note that percentages are calculated simply: (explosive plays/total plays)100; I figured this might be a useful metric since there is a some difference in how many plays teams run, especially when you split it up into run and pass plays. I couldn’t help but notice the Bears’ explosive play rankings pretty closely matched some of their overall offensive rankings. Outside of points scored, which was buoyed by defensive touchdowns, Chicago’s offense was generally below average in most categories. Thus I wanted to look and see if there was any correlation between explosive plays and overall offensive performance. I looked specifically at explosive plays or explosive play % vs. points scored or Football Outsiders’ offensive DVOA, which are two general metrics to measure the offense as a whole. The four graphs can be seen below. Don’t worry too much about the numbers, just focus on the general trend. 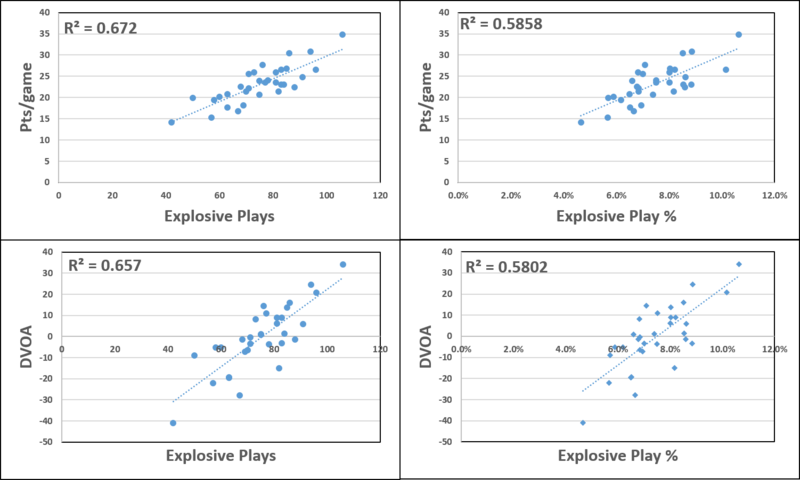 All four graphs show a clear trend such that more explosive plays leads to better offensive performance. This can be quantified with the correlation (r2) values on each graph, which range from 0.58 to 0.67. That can be loosely interpreted to mean that roughly 60-65% of offensive performance is based on big plays. Since explosive plays are so important for a good offense, it makes sense to look at what Bears players are and are not producing them. The table below shows that information for Chicago’s main weapons, with their complementary skill position players (and defensive linemen turned skill position players periodically) grouped into the “other” category. The explosive pass % for non-QBs is a little wonky, as for teams and QBs it includes sacks under total plays, but for other players can only include target information, removing sacks from the equation. Thus those numbers are a bit higher than the team totals. 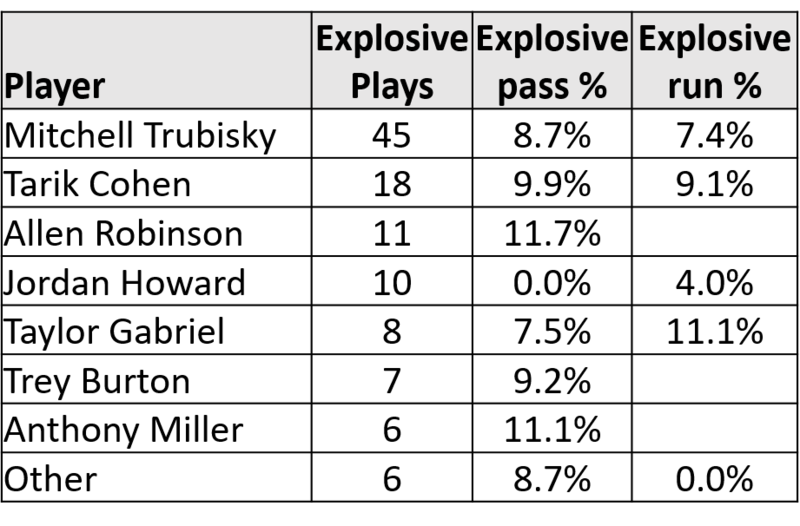 With that said, Trubisky produced explosive passes through the air at a league average rate. The Bears were brought down by 2 games with Chase Daniel, whose explosive pass % was only 7.1%. As previously noted, Trubisky struggled to throw deep balls efficiently, but he also tried to throw them a lot, so overall he still got a decent number of them. This should come as no surprise to anybody, but Tarik Cohen is an explosive play waiting to happen. He was excellent at producing big plays on the ground and through the air. Jordan Howard, on the other hand… oof. I can’t think of a better stat to explain why the Bears need to upgrade him than the fact that he only had 10 explosive plays in 276 combined carries + targets. If you remove Howard’s plays from the offense, the Bears were actually above average producing explosive plays on the ground and through the air. Upgrading Howard this offseason has to happen for the offense to take a significant step forward (as I have said is likely). Taylor Gabriel has a bit of a low explosive pass % here, but with a somewhat small target number he was basically 1-2 plays short of average. Likewise, his high explosive run % is from 1 explosive run out of 9 total. You’d think somebody with that kind of speed would make more big plays. Maybe the Bears didn’t use him quite right, or maybe Trubisky just missed him too often. I’d like to see his total targets decrease next year, probably in favor of Anthony Miller. I think shifting Gabriel from a primary receiving role into more of a WR3/deep shot specialist would be a better way to use him. The Bears did a decent job of getting some big passing plays out of their role players, but didn’t get a single explosive run from that group. Most of that falls on Benny Cunningham and Taquan Mizzell, who had 20 combined carries for 36 yards, with a long of 7. I think it’s safe to say better depth at RB is needed.